The creation of Union buildings on campuses around the US was an up-and-coming trend at the turn of the century. The Michigan Agricultural College wanted a Union of their own and began a committee to be in charge of overseeing the project in 1905. Funds however were scarce so only the architectural drawings and alumni support occurred at this time. It was not until 1915 when the idea of building a MAC Union was revived. The graduating class pledged $5 from each student and with the help of the Alumni Association began the plans to construct an MAC Union. The original plan was to convert College Hall into a union building. This plan was approved and as the interior of College Hall was being revamped in August of 191, the building collapsed. The Committee yet again began raising funds to create a brand new building to act as a union but also to serve as a memorial to the soldiers who fought in World War I. The projected budget for the project was about $500,000. Pond & Pond Architects, who also planned the unions of University of Michigan and Purdue, were hired to design the new building. The Groundbreaking ceremony took place on November 19, 1923 and was followed by what was called “Excavation Week”. “Excavation Week” for the MAC Union was one that will forever be remembered as it was the first of its kind in the nation. Lasting five days from November 19-24, the media covered the event. Movies were taken primarily so the students can see what they looked like and the event yielded great progress. Male students were divided up into a total of 30 teams. The names of the students were listed in The Holcad newspaper and students were instructed to look there for the day and time of their shifts. Each shift would have a leader; the leaders included: W.C. Johnson, Don Clark, Matrice Taylor, A.C. MacIntyre, Harold Archibold, Elmer Perrine, Bub Kuhn, Ted Frank, J.L. Kidman, and Dutch Allen. The morning shift would work from 8am-12am and then break for lunch. The afternoon shift came in at 1pm and worked until 5pm. Students were required to work four hours before they were excused for the day. Excavation week was very labor intensive but also had its fun activities as well. 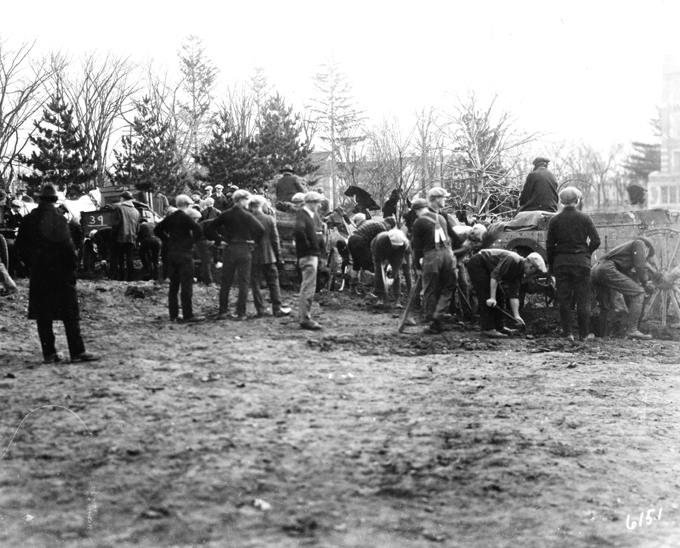 There were daily appearances by the Swartz Creek and Varsity bands, the girls would bring out refreshments, and the campus faculty would also engage in the digging activities. Competitions were also set up. Each day there were two teams and the team who accomplished the most work at the end of the day would win a prize. There was also a thermometer gauge kept on the site to keep track of the overall progress. As a result of a lot of hard work and sweat, the MAC Memorial Union building was opened on June 12, 1925. At the time of its opening the Union was quite different than it is today. The main entrance was off of faculty row (currently West Circle Drive), there were 11 dining rooms (some were available to both men and women, and some available only to men), 10 conference rooms, a 2-story assembly hall, separate lounging rooms for men and women, a barber shop, a beauty parlor, a Billiards room (for men only, of course), and a total of 16 guest rooms each with its own bathroom. The building was the center of life on campus. Constantly full, men and women would mingle, people would enjoy a nice lunch, and guests were able to stay overnight so they could experience college life with their friends. 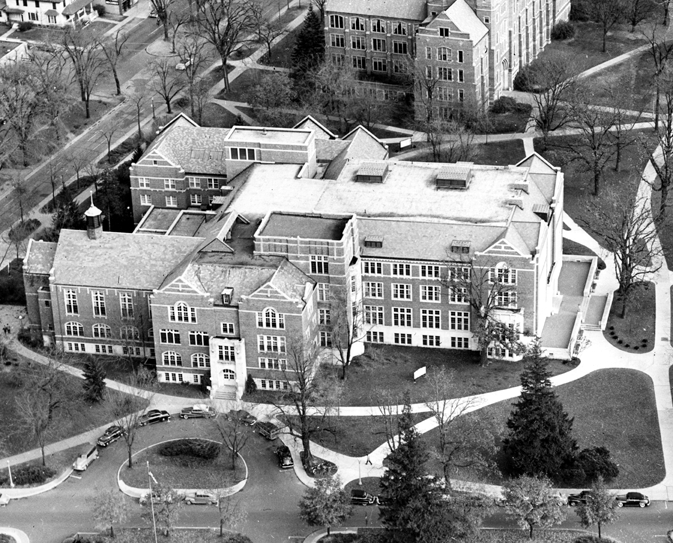 Over the years, the Union has undergone many changes and renovations to be what it is today. 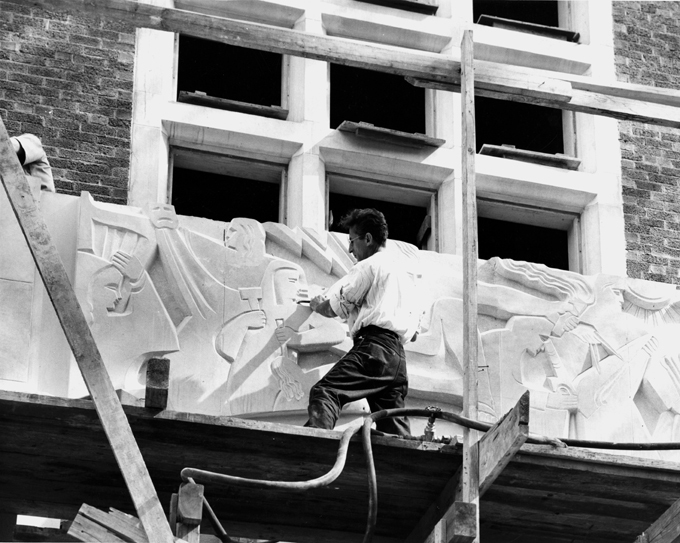 Samuel Cashwan, the same artist who sculpted the agricultural sign at the Abbot and Grand River intersection, sculptured the outside decoration above each of the doors at the Union. Do you know of those tables in the Union Grill area that have all of the etchings in them? – Do you know where they came from or whose names they are? 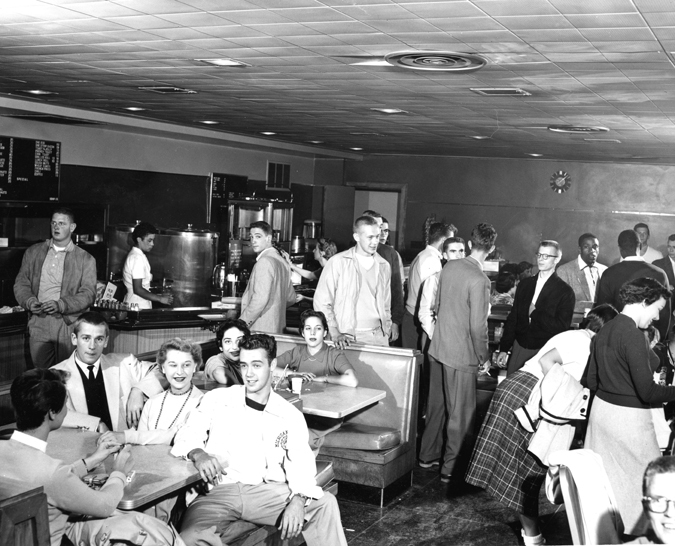 In the 1950s-’60s, there was a “Senior Room” located by the Union Grill. This was a dining room designated specifically for seniors. These wooden top tables were located in this eatery and when the seniors graduated, they would etch their names into the tables. Card playing has always been a favorite pastime of students. 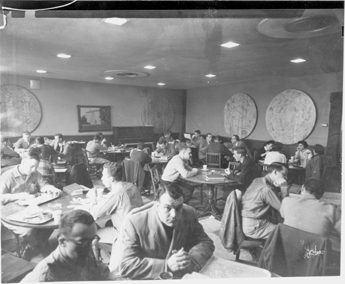 In the late ’50s, the administration believed that the frequent card playing going on in the Union Grill was a bad reflection of campus. They believed that students were supposed to be pursuing intellectual past times instead of playing cards all day. So in 1960, card playing was officially banned from the Grill. Instead of playing here, card rooms were opened on the 4th and ground floors for students to play the decks. At one point in time, the Union had pinball machines! In 1971 the Union management agreed to install Pinball Machines in the Billiard Room. However, these were taken out when the room underwent renovations. Often times when students are hungry and looking to grab a quick bite, they will head over to the Union Grill to grab some grub. Did you know that in the early 1930s hamburgers were only 30¢! In a 1968 publication, students were complaining that price skyrocketed to 40¢! Oh what I would give to only pay thirty or forty cents for a burger. So, after reading this, I encourage you to go explore the Union and think about what it was like almost 50 years ago. I know I would give anything to go back in time and have an ice cold Coke at the Union Grill! I’ll start with the good news first. The construction around Conrad Hall is finished! The water main has been replaced, the streets are open and the sidewalks are repaired. The grounds people still need to put in some grass where it has been ripped up, but otherwise the traffic is flowing as usual around the archives. Now for the bad news. Parking Lot 32, across the street from Conrad/Fee Halls has been changed from a token lot to a metered lot. The cost to use the coin lot will be $1.50 per hour. A customer may feed the meter for up to 4 hours worth of parking at one time. For people needing to park longer than 4 hours, you will need to go back to the meter and enter more coins. Visitors to the archives may purchase special tokens to use in the meters. These tokens are good for 2 hours worth of parking and cost $1.00 each. Again, only 4 hours worth of parking can be purchased at one time. Visitors to the archives needing to stay longer than 4 hours must go back and insert more tokens/cash after the initial 4 hours has expired. The change in the visitor lot parking comes from the fact that the equipment monitoring the entry/exit of vehicles was broken more frequently than it was operational. We hope that this change in the parking situation works for all visitors to the University Archives. Please understand that we do not control the visitor lot, but if there are problems or complaints we would be happy to listen and pass them on to the appropriate department on campus. Thank you for your cooperation in this matter. It’s that time again: spring is here, the flowers are blooming, and the majority of the students have gone home for the summer. At Michigan State University that means only one thing – time to work on the roads. There are always lots of construction projects going on at MSU during the summer, but they mostly take place away from Conrad Hall and the archives are not affected. Until now, that is. Currently, Conrad Hall is surrounded by constructions projects. There are road closure signs on Fee Road and Wilson Road, though there is still access to the parking lots and the building. MSU Physical Plant has a website where they give construction alerts. News about the Wilson Road construction and other projects should be updated all summer long. You can access that website here. We will keep you updated on any changes to construction, road closures, and detours. If you are having trouble accessing Conrad Hall this summer, please call (517-355-2330) and let us know. Staff will suggest alternate routes to get you here.